Because of our vast experience in commercial aluminium fenestration manufacturing and installation, where projects are usually highly complex and challenging, residential projects are comfortably within the capability of our hugely experienced team. 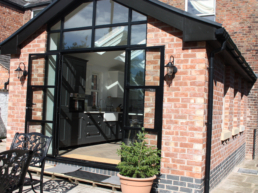 We work with Architects, Builders or directly with end clients to provide imaginative, unique, cost-effective glazing solutions guaranteed to enhance any property, be it new build or refurbishment. For the last 10 years, aluminium windows and doors have been increasingly selected by Architects for ‘Grand Design’ projects. As aluminium systems have become more affordable, their use has also increased in less ostentatious homes too. Thermally broken aluminium profiles offer excellent thermal values and our doors and windows commonly exceed government standards. These values help us reduce your carbon footprint and keep your home warmer at lower cost and you will be draft free. Stag aluminium windows and doors are virtually maintenance free. Our aluminium profiles are polyester powder coated in a ‘Qualicoat Approved’ paint plant. Once painted, our products offer excellent resistance to the weather and are not susceptible to corrosion provided they are regularly cleaned. Aluminium has a proven performance record and it’s no wonder that aircraft wings are also made from this magical material. Aluminium frames are the natural choice if large areas of glass are required.Our windows and doors are slim and strong and will stand the test of time, also keeping would-be intruders at bay. Aluminium windows and doors can be painted almost any colour and will also accept technical, yet hard wearing textura and anodised finishes. The added benefit being that colours will not fade and if specified at the time of order, our products can be supplied with a full marine guarantee.Architects recognise that aluminium windows and doors require very little maintenance, can be supplied in a vast range of styles and finishes and even though they are 100% recyclable, they will outperform uPVC and timber. On initial purchase, aluminium doors and windows will be slightly more expensive than uPVC and are usually comparable to hardwood. There is little doubt that over 20 years, aluminium products will require less maintenance than these other materials and will not fade or rot. Regular cleaning with warm soapy water and a light oiling of any ironmongery will suffice to keep your windows and doors looking great and operating perfectly for decades.